Georges Braque was born on May 13, 1882, in Argenteuil-sur-Seine, France. He grew up in Le Havre and studied evenings at the Ecole des Beaux-Arts there from about 1897 to 1899. From 1902 to 1904, he painted at the Académie Humbert in Paris, where he met Marie Laurencin and Francis Picabia. By 1906, Braque’s work was no longer Impressionist but Fauve in style. From 1909, Pablo Picasso and Braque worked together in developing Cubism; by 1911, their styles were extremely similar. In 1912, they started to incorporate collage elements into their paintings and to experiment with the papier collé (pasted paper) technique. Their artistic collaboration lasted until 1914. Braque served in the French army during World War I and was wounded; upon his recovery in 1917, he began a close friendship with Juan Gris.In the mid-1920s, Braque designed the decor for two Sergei Diaghilev ballets. By the end of the decade, he had returned to a more realistic interpretation of nature, although certain aspects of Cubism always remained present in his work. In 1931, Braque made his first engraved plasters and began to portray mythological subjects. He won First Prize at the Carnegie International, Pittsburgh, in 1937.During World War II, Braque remained in Paris. In addition to paintings, Braque also made lithographs, engravings, and sculpture. 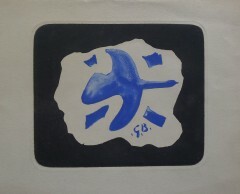 From the late 1940s, he treated various recurring themes, such as birds, ateliers, landscapes, and seascapes. In 1954, he designed stained-glass windows for the church of Varengeville. During the last few years of his life, Braque’s ill health prevented him from undertaking further large-scale commissions, but he continued to paint, make lithographs, and design jewellery. He died on August 31, 1963, in Paris.